I'll let you figure out these details by researching the datasheet yourself! Consider the square wave voltage source in this schematic as a source of alternating "high" and "low" logic states, 5 volts and 0 volts respectively. Determine what sort of voltage exists across the liquid crystal fluid with the switch in the open position as well as the closed position, and from this determine which switch position results in a darkened LCD versus a transparent LCD. 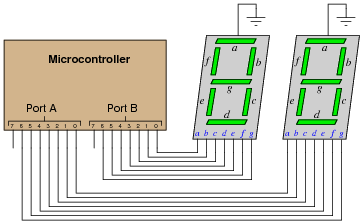 The particular method of generating AC from DC using an XOR gate is quite clever. Essentially, we are using the XOR's ability as a controlled inverter/buffer to reverse "polarity" of the square wave signal. 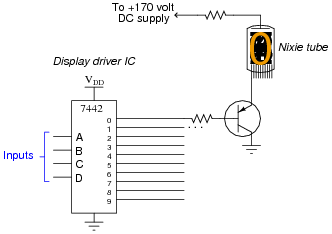 Be sure to have your students explain how AC is applied across the LCD in this circuit. 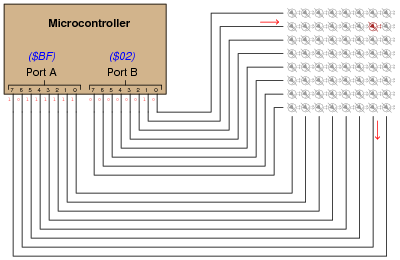 "Ripple blanking" is used in multi-digit displays to force leading or trailing zeroes to the off state. Be sure to ask your students where they were able to research multiplexed 7-segment displays, and what they think about this particular technique of producing a "continuous" three-digit decimal display by flashing them very rapidly. Clever techniques such as this are often necessary to make the most of limited hardware. By the way, I have omitted the customary LED current-limiting resistors from the schematic diagrams, for brevity's sake. See if any of your students are able to catch this omission! 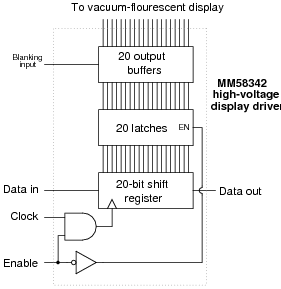 The MM58342 high-voltage display driver IC from National Semiconductor serves as an interface between either a microprocessor or microcontroller and a high-voltage vacuum fluorescent (VF) display panel. The IC reads and conditions 20 bits of data to drive 20 "grids" in such a display. 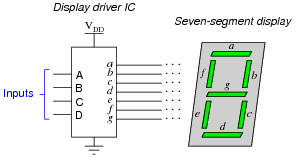 When combined with a similar driver driving the anodes of the same VF display, individual pixels (or combinations of pixels) may be controlled (lit). It is interesting to note (and discuss with your students) that this IC does not decode characters. It merely conditions and outputs bits of information to the grids of a VF display. Ask your students, then, where they think the patterns of ön" and öff" pixels must be generated to form specific characters on the display. An örganic" LED is one made from organic (carbon-containing) molecules instead of crystalline silicon, gallium arsenide, or other more traditional semiconductor substances. One distinct advantage of these devices is their ease of manufacture, but I'll let you research exactly why (as well as other advantages of these devices). This question is destined for obsolescence, as organic LEDs will either become so popular as to lose their novelty ("new technology") or become supplanted by something even better. But for now (May 2005), they are worthy of their own question in the Socratic Electronics project! 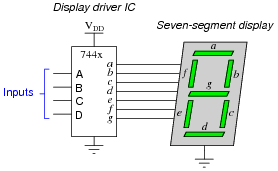 Neither the 7447 nor the 7448 are designed to source current to the LED segments, only sink current. I'll let you figure out why the 7448 chip has the ability to make any of the LED segments light up at all. An obsolete display technology that still finds enthusiastic followers in the hobbyist world, called Nixie tubes, relies on a BCD-to-10 decoder to drive one of ten different metal cathodes inside a neon-filled glass bulb. For each BCD code, exactly one of the cathode figures inside the "Nixie tube" will glow, causing that numeral to shine with a pink-orange light. The tube receives power through a common anode (usually over 150 volts DC). Follow-up question: comment on your friends' strategy to connect only one transistor to one Nixie tube cathode for a test. Was this a good idea? Why or why not? Did doing this save the 7442 from further damage? I have left the answer purposefully vague so that students will have to figure out how to properly use BJTs to drive the Nixie tube cathodes. This is a good opportunity for them to review BJT theory and switch application use, so don't spoil it by giving away the answer! Modern LCD technology is much better, is still not as good as viewing printed paper, the "gold standard" for non-emissive display. One term frequently used to describe the quality of viewing with regard to angle is Lambertian. Define what "Lambertian" means with regard to display surfaces. A "Lambertian" surface emits (or reflects) light with an intensity proportional to the cosine of the viewing angle (relative to perpendicular). Paper is Lambertian in its reflective characteristics, which is one of the reasons it is so easy to read compared to contemporary digital display technologies.